New Hampshire's White Mountains are among the best loved natural treasures in the Northeast. Located within a day's drive of Boston, New York City, and Montreal, they draw more than 6 million visitors each year for outdoor activities ranging from hiking and fishing to skiing and snowshoeing. 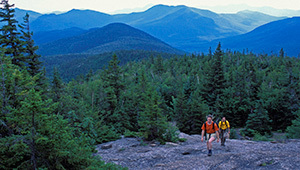 The 800,000-acre White Mountain National Forest is the region's signature attraction, encompassing five National Wilderness Areas and four dozen peaks above 4,000 feet. Since 2001, The Trust for Public Land, in partnership with the White Mountain National Forest and the Appalachian Mountain Club, have conserved over 15,000 acres of land in the White Mountain National Forest including 24 miles of trails. This includes trailheads and portions of trails for Piper Trail, Castle Trail, Davis Path, and Haystack Notch and Miles Notch Trails. Map of our work in the White Mountains.